The closing day of a festival is always something of an emotional event, part of you just wants to carry on, to live one giant hurrah, never returning to normal life; part of you would quite like a cup of tea, a sit in the shade and an early night….maybe just a few hours off from the cider. 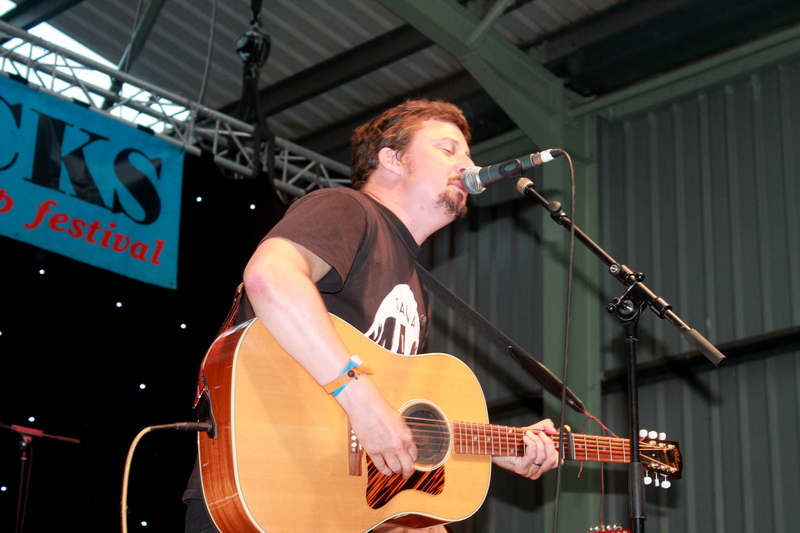 Well, with the relatively short length of Indietracks, there’s far too much going on for any of that, so stop your crying and get back on the real ale, there’s loads of great stuff still to be seeing! The walk from the campsite to the festival is soundtracked by the punk-pop strains of Axolotes Mexicanos. Frontwoman Olaya is not always entirely in tune but she more than makes up for it with a delightful energy, and sense of pure fun. The music behind her is a feisty punk racket and the whole thing results in the rather odd feeling that you’re watching the Ramones fronted by a Spanish Poly Styrene. It’s the perfect wake up call for a slightly tired crowd. From there it’s over to a packed out Church Stage to take in Watoo Watoo. They’re a two-piece band from Bordeaux who specialise in swoonsome Indie-pop, with hints of classic French pop thrown in. Sadly they’re something of a disappointment, the bass is far too loud in the mix, and with the rest of the music being played by a laptop there’s the sense you’re watching something resembling karaoke. The songs have a lot of potential, which only adds to the disappointment. It’s over to the Outdoor stage next for The Very Most. The brainchild of frontman Jeremy Jensen, they are fleshed out today to a full band by the presence of a hastily assembled band, put together for their current European jaunt. The band deal in a pleasant brand on sunshine Indie-pop, think an American Belle & Sebastian, with a touch of the Magic Numbers thrown in and you wont be far off. As Jeremy sings “I know your secret, you’re in love with the sun” it’s hard to disagree. They’re ideal afternoon fair, and the majority of the crowd take them in from seats on the hill, as ice cream and pints of ale are consumed in stunning quantities; and there’s a most concerning development, they’ve run out of Twisters! If The Very Most were made for Sunny afternoons, Night Flowers are a very different beast, though I doubt many bands from Hull have specialised in songs for sunny Sundays. 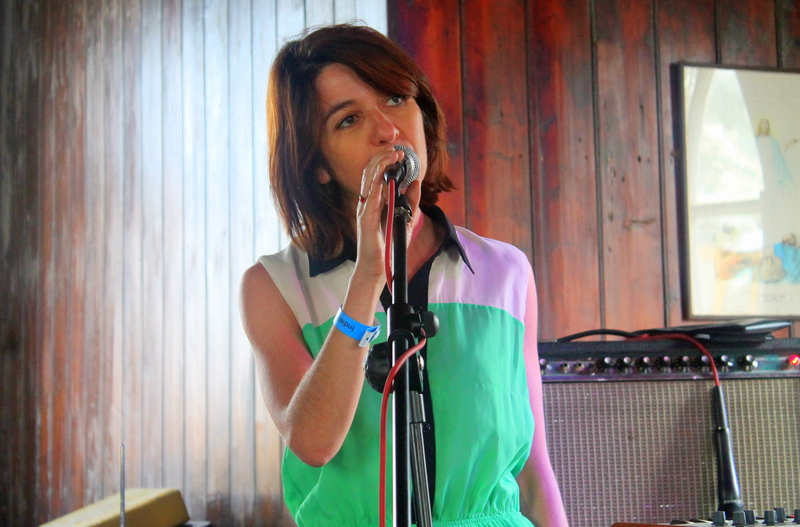 What Night Flowers do specialise in is a brilliant take on classic Indie. Vocal duties are split evenly between male and female, and they recall both early 90’s shoe-gaze and the turn of the millenium Canadian bands such as The Stills or Stars. Beneath layers of reverb heavy guitars they possess a series of brilliant pop-choruses. They’re an entertaining live band too, all seemingly constantly moving, Hetty in particular flails a tambourine with a flourish! The material on show is largely taken from their impressive self titled EP, and with a number of other tracks already written, here’s hoping for some more recorded material in the near future. Let’s Wrestle have sadly been forced to cancel, but that does at least make the potential multiple band pile up at the end of the day a bit more easy to manage. So next on our agenda are Sweet Baboo, the latest in a lineage of unique Welsh songwriters; indeed there’s more than a hint of yesterdays headliner Gruff Rhys about him, particularly in his stilted but ultimately hilarious on-stage banter. His music is varied beast, from simple acoustic number, to a more widescreen taken on Americana. I Am A Dancer is a particular highlight, reminiscent of Bill Callahan or even Wilco, whilst elsewhere there’s hints of The Wave Pictures in his bizarre outlook on the mundane details of everyday living. 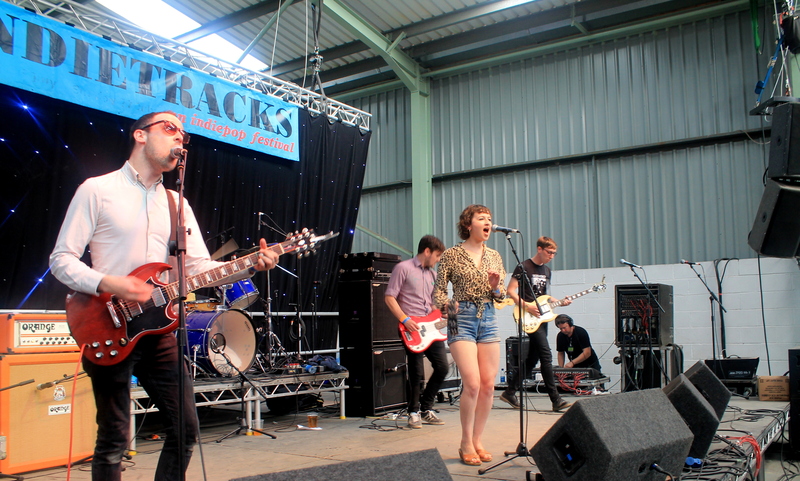 The Just Joans and Indietracks are surely a match made in heaven, and the band fly through a set of riotous crowd pleasers. Whilst a bad cover version of Pulp is not the real thing, when they play their own inescapable anthems they’re a hoot. If You Don’t Pull is introduced as an Allo Darlin’ cover, after their collaboration the other evening, while closing track What Do We Do Now would have been an appropriate closer to the festival, “what do we do now? Now our time is over?” they sing and the whole place gets a bit emotional at the impending reality that it’s nearly done, but not yet folks! The song is also noteworthy for the brilliantly unromantic line “I always think of you, when I smell cider.” There’s no denying just how wonderful The Just Joans can make you feel! They’re followed by the indoor stages closing act, fellow Scots, Withered Hand. Never quite sure what we think of Withered Hand, and tonights set continues the theme. At time he recalls a down-tempo Frightened Rabbit, or even the hugely underrated indie of The Crimea and it’s wonderful, however at times he slips a bit too close to the arena-acoustic, mediocrity of Frank Turner. A fine run towards the end and I must admit I’m beginning to be converted. The closing moments including the excellent Love In The Time Of Ecstasy and the brilliant California, which shows a similarly in depth knowledge of the history of US song-writing as the excellent Horse Thief record from earlier this year make for a superb conclusion. If you’re winning over your critics you’re doing a fine job! 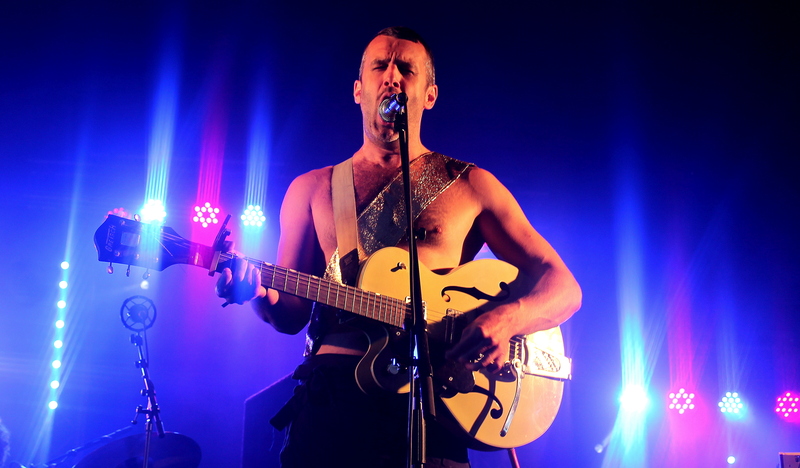 We reach the closing act of the festival, and what a superb decision it proves to be to conclude with The Hidden Cameras. The Canadian’s are fronted by Joel Gibb, who memorably described their music as “gay church folk music” and from the outset, they’re just as camp and just as fun as that sounds like it would be. Their take on indie-pop, permeated with slick synth pop, actually sounds as polished as any act performing this weekend, which is quite a surprise for a band who arrived on stage wearing very little apart from gold sashes and what looks a bit like a bundled up curtain converted into skirts. Hidden Cameras close the fesitval, in quite some style! The bands previous efforts to headline the festival were thwarted by generator failures, however this brilliant set, borrowing highlights from throughout their career is a fitting finale and more than makes up for the disappointment of previous years. The festival in a way ends there but the party lingers on. The strains of indie-classics ring loud in the air till the early hours as the revellers refuse to accept the crippling reality that it’s over, at least till this time next year, when to borrow a turn of phrase from Steven Gerrard, we go again!